Noise may be defined as any unwanted sound. Sound becomes noise when it is too loud, unexpected, uncontrolled, happens at the wrong time, contains unwanted pure tones or unpleasant. In addition to being annoying, loud noise can cause hearing loss, and, depending on other factors, can affect stress level, sleep patterns and heart rate. The primary object for determining subjective estimations of loudness is to present sounds to a sample of listeners under controlled conditions. In heating, ventilation and air conditioning (HVAC) systems only the ventilation fan industry (e.g., bathroom exhaust and sidewall propeller fans) uses loudness ratings. In order to find satisfaction, percent of exposure to noise is the valuable issue for the personnel who are working in these areas. The room criterion (RC) method has been defined by ANSI standard S12.2, which is based on measured levels of in HVAC systems noise in spaces and is used primarily as a diagnostic tool. The RC method consists of a family of criteria curves and a rating procedure. RC measures background noise in the building over the frequency range of 16-4000 Hz. This rating system requires determination of the mid-frequency average level and determining the perceived balance between high-frequency (HF) sound and low-frequency (LF) sound. 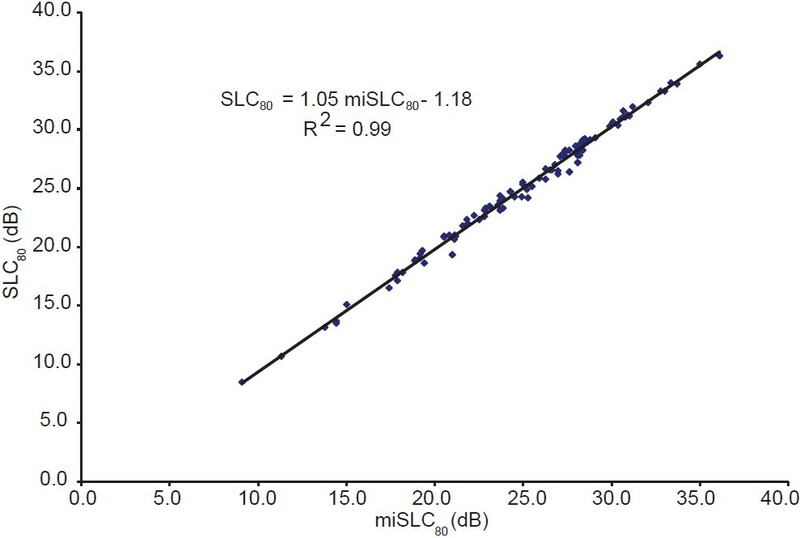 The arithmetic average of the sound levels in the 500, 1000 and 2000 Hz octave bands is 44.6 dB; therefore, the RC 45 curve is selected as the reference for spectrum quality evaluation. 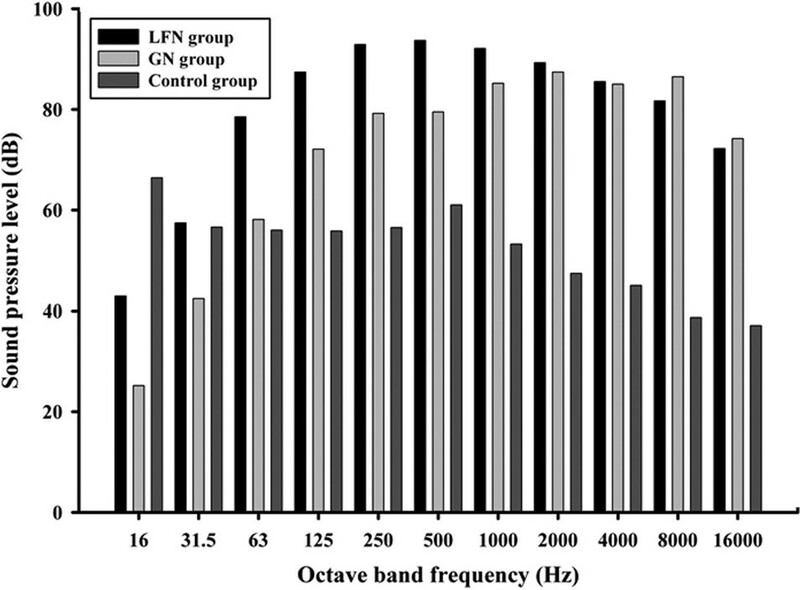 The spectral deviation factors in the LF, medium-frequency sound and HF regions are 2.9, 7.5 and -2.3, respectively, giving a Quality Assessment Index (QAI) of 9.8. This concludes the QAI is useful in estimating an occupant's probable reaction when the system design does not produce optimum sound quality. Thus, a QAI between 5 and 10 dB represents a marginal situation in which acceptance by an occupant is questionable. 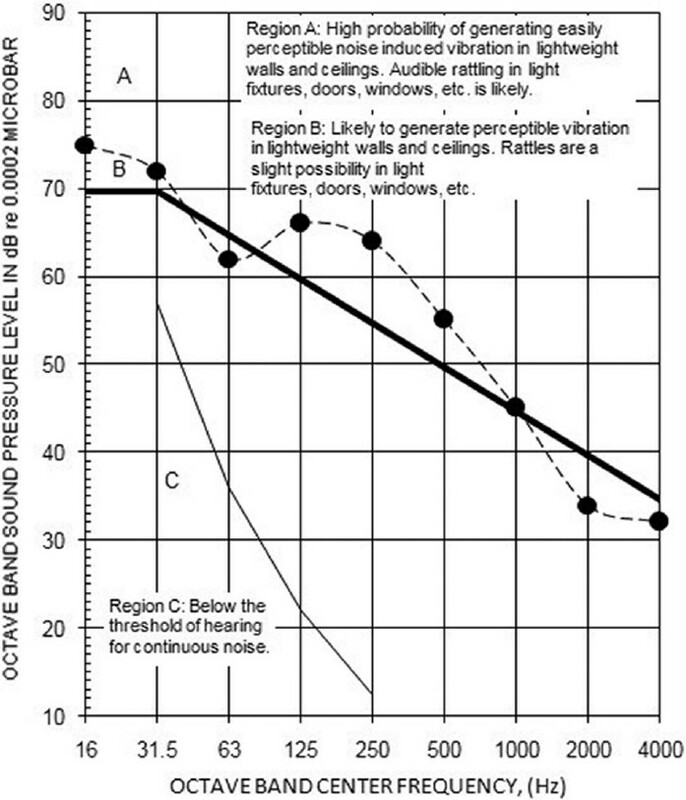 However, when sound pressure levels in the 16 or 31.5 Hz octave bands exceed 65 dB, vibration in lightweight office construction is possible. Long-term exposure to traffic noise has been suggested to increase the risk of cardiovascular diseases (CVD). However, few studies have been performed in the general population and on railway noise. This study aimed to investigate the cardiovascular effects of living near noisy roads and railways. This cross-sectional study comprised 25,851 men and women, aged 18-80 years, who had resided in Sweden for at least 5 years. All subjects participated in a National Environmental Health Survey, performed in 2007, in which they reported on health, annoyance reactions and environmental factors. Questionnaire data on self-reported doctor's diagnosis of hypertension and/or CVD were used as outcomes. Exposure was assessed as Traffic Load (millions of vehicle kilometres per year) within 500 m around each participant's residential address. For a sub-population (n = 2498), we also assessed road traffic and railway noise in L den at the dwelling façade. Multiple logistic regression models were used to assess Prevalence Odds Ratios (POR) and 95% Confidence Intervals (CI). No statistically significant associations were found between Traffic Load and self-reported hypertension or CVD. In the sub-population, there was no association between road traffic noise and the outcomes; however, an increased risk of CVD was suggested among subjects exposed to railway noise ≥50 dB(A); POR 1.55 (95% CI 1.00-2.40). Neither Traffic Load nor road traffic noise was, in this study, associated with self-reported cardiovascular outcomes. However, there was a borderline-significant association between railway noise and CVD. The lack of association for road traffic may be due to methodological limitations. Due to the transposition of the EU Directive 2003/10/EC into Irish Law, the entertainment sector was obligated to comply with the requirements of the Safety, Health and Welfare at Work (General Application) Regulations 2007, Chapter 1 Part 5: Control of Noise at Work since February 2008. 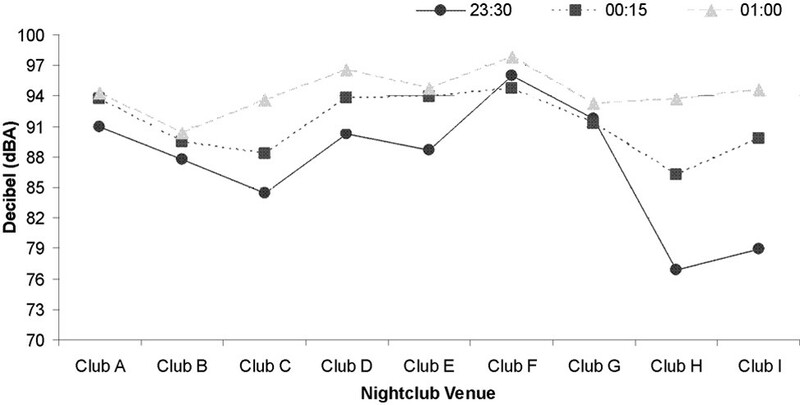 Compliance with the Noise Regulations was examined in 9 nightclubs in Ireland. The typical daily noise exposure of 19 bar employees was measured using 2 logging dosimeters and a Type 1 fixed position sound level meter. Physical site inspections identified nightclub noise control measures. Interviews and questionnaires were used to assess the managers and employees awareness of the noise legislation. The average bar employee daily noise exposure (L EX, 8h) was 92 dBA, almost 4 times more than the accepted legal limit. None of the venues examined were fully compliant with the requirements of the 2007 Noise Regulations, and awareness of this legislation was limited. The hearing condition of the Taiwanese aerospace maintenance workers affected by the low frequency noise had not been reported. The purpose of this research is to clarify the maintenance workers' health effect when exposed to low frequency and/or general noises and to understand the relationship between the variations of the worker's echocardiographic E/A ratio and the low frequency noise. The low frequency noise monitoring and echocardiographic E/A ratio results obtained for 213 aerospace maintenance workers indicated that the workers' hearing loss was more serious at high frequency 4k and 6k when exposed to the low frequency noise and could be more than 40 dB. The abnormality of echocardiographic E/A ratio was also higher than that of control group. The aim of this study was to examine the possible association of combined exposure of noise and hand-arm vibration (HAV) and the risk of noise-induced hearing loss. Workers in a heavy engineering industry were part of a dynamic cohort. Of these workers, 189 had HAV exposure, and their age and hearing status were recorded in the same year and were, therefore, included in the analysis. Data on HAV duration and acceleration was gathered through questionnaires, observations, and measurements. All available audiograms were categorized into normal and hearing loss. The first exposure variable included the lifetime HAV exposure. The lifetime HAV exposure was multiplied by the acceleration of HAV for the second and third exposure variable. Logistic regression using the Generalized Estimation Equations method was chosen to analyze the data to account for the repeated measurements. The analysis was performed with both continuous exposure variables and with exposure variables grouped into exposure quartiles with hearing loss as an outcome and age as a covariate. With continuous exposure variables, the odds ratio (OR) with a 95% confidence interval (CI) for hearing loss was equal to or greater than one for all exposure variables. When the exposure variables were grouped into quartiles, the OR with a 95% CI was greater than one at the third and fourth quartile. The results show that working with vibrating machines in an environment with noise exposure increases the risk of hearing loss, supporting an association between exposure to noise and HAV, and the noise-induced hearing loss. 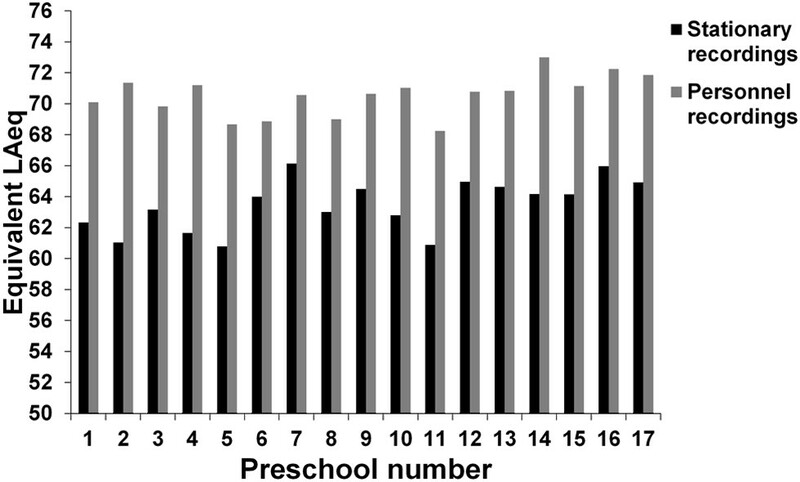 The aim of the study was to analyze the presence of stress-related health problems among preschool employees and the way in which these reactions are related to noise and other work parameters. The investigation included 101 employees at 17 preschools in Umeå County, located in northern Sweden. Individual noise recordings and recordings in dining rooms and play halls were made at two departments from each preschool. The adverse effects on the employees were analyzed by use of different validated questionnaires and by saliva cortisol samples. Stress and energy output were pronounced among the employees, and about 30% of the staff experienced strong burnout syndromes. Mental recovery after work was low, indicated by remaining high levels of stress after work. The burnout symptoms were associated with reduced sleep quality and morning sleepiness. Cortisol levels supported the conclusion about pronounced daily stress levels of the preschool employees. Early detection of non-organic hearing loss (NOHL) is important in order to ensure appropriate management decisions. One possible audiometric test for achieving this is the tone-in-noise (TIN) test although its current format is not widely applicable and may not optimize accuracy. We sought to investigate a modified TIN test, using narrowband noise, and the influence of different noise levels and alternative approaches to determining the outcome. Seventy-five normal-hearing and 8 hearing-impaired subjects were asked to feign or exaggerate a hearing loss. The shift in genuine or exaggerated/feigned thresholds with the introduction of ipsilateral noise was determined. 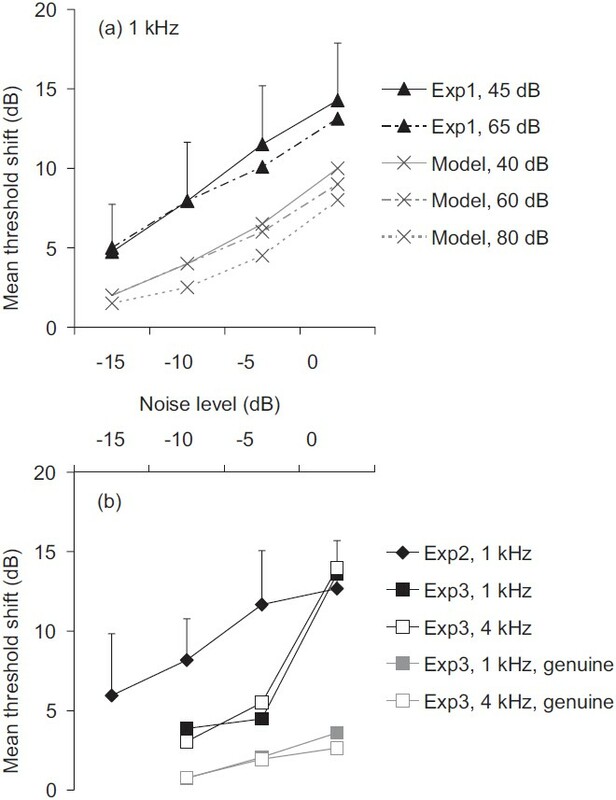 The TIN test was able to accurately separate between genuine and feigned thresholds when using narrowband noise presented at the effective masking level corresponding to the apparent tone threshold and using a 'fail' criterion of a repeatable threshold shift of ≥ 10 dB at one or more frequencies. It also produced similar shifts in exaggerated thresholds. In conclusion, this modified TIN test is a potentially accurate method to rapidly identify unilateral and bilateral NOHL in a wide range on contexts and could be applied to automated audiometry. Measuring non-auditory effects of noise such as stress-inducing ones have become of interest recently. Salivary cortisol has become a popular measure in stress research. So, assessing noise-induced stress via saliva cortisol evaluation can present a bright future in non-invasive exposure assessment methods. This study had 3 goals: (1) Assess and compare saliva cortisol concentrations in the morning and evening in normal work day and leisure day in industrial workers, (2) assess the relationship between industrial noise exposure and salivary cortisol concentrations, and (3) assess the possibility of using salivary cortisol as a possible marker of noise-induced stress. This study included 80 male participants working in 4 different parts (painting, assembling lines, casting, and packaging) of a household manufacturing company. Morning and evening saliva samples were collected at 7.00 am and 4.00 pm, respectively. Noise exposure levels were assessed by sound level meter and noise dosimeter. All measurements occurred in two days: One in leisure day and other in working day. Descriptive statistics, paired sample t-test, and regression analysis were used as statistical tools of this study with P < 0.05. On the leisure day, morning salivary cortisol (geometric mean [GM], 15.0; 95% CI, 12.0 to 19.0 nmol/L) was significantly higher than evening cortisol (GM, 5.2; 95% CI, 4.2 to 6.3 nmol/L) (P < 0.05). Also, on the working day, morning salivary cortisol (GM, 14.0; 95% CI, 11.25 to 18.0 nmol/L) was significantly higher than evening cortisol (GM, 8.0; 95% CI, 6.5 to 10.0 nmol/L) (P < 0.05). No significant difference was obtained for morning cortisol levels between leisure day and working day samples (P = 0.117). But, for evening cortisol concentrations, a strong significant difference was noted leisure day and working day (P < 0.001). The evening cortisol in the working day correlated significantly with noise exposure > 80 dBA. Our study revealed that industrial noise, with levels > 80 dBA, has a significant effect on salivary cortisol elevation. Internationally accepted exposure-response relationships show that railway noise causes less annoyance than road traffic and aircraft noise. Railway transport, both passenger and freight transport, is increasing, and new railway lines are planned for environmental reasons. The combination of more frequent railway traffic and faster and heavier trains will, most probably, lead to more disturbances from railway traffic in the near future. To effectively plan for mitigations against noise and vibration from railway traffic, new studies are needed to obtain a better basis of knowledge. The main objectives of the present study was to investigate how the relationship between noise levels from railway traffic and general annoyance is influenced by (i) number of trains, (ii) the presence of ground borne vibrations, and (iii) building situational factors, such as orientation of balcony/patio and bedroom window. Socio-acoustic field studies were executed in residential areas; (1) with relatively intense railway traffic; (2) with strong vibrations, and; (3) with the most intense railway traffic in the country. Data was obtained for 1695 respondents exposed to sound levels ranging from L Aeq,24h 45 to 65 dB. Both number of trains and presence of ground-borne vibrations, and not just the noise level per se, are of relevance for how annoying railway noise is perceived. The results imply that, for the proportion annoyed to be equal, a 5 - 7 dB lower noise level is needed in areas where the railway traffic causes strong ground-borne vibrations and in areas with a very large number of trains. General noise annoyance was twice as high among residents in dwellings with balcony / patio oriented towards the railway and about 1.5 times higher among residents with bedroom windows facing the railway. Occupational noise is a significant contributor to disabling hearing loss worldwide. Noise-induced hearing loss (NIHL) has resulted in huge human and economic consequences costing New Zealand approximately $53M annually and rising. A high proportion of hearing loss claims are made by workers in the manufacturing sector. Hearing protection devices (HPDs) are used together with engineering and administrative controls to minimize noise exposure and to prevent hearing loss. Unfortunately, inconsistent and improper use of HPDs has hindered efforts to prevent NIHL. The purpose of this study was to understand the factors that influence the use of HPDs amongst a group of manufacturing workers in New Zealand. A purposive sample of twenty-five workers was recruited to take part in semi-structured interviews. The open-ended questions were aimed at exploring the participants' knowledge, attitude, beliefs, and behavior towards noise and HPDs. The data were analyzed using conventional content analysis and key themes emerged in relation to HPD use. Themes that emerged from the interviews either supported good hearing protection behavior or acted as barriers against it. Five major themes, (perception of noise, hearing preservation, reluctance to use HPDs, workplace interaction, and value of hearing) and sub-themes described various factors that influence hearing protection use. Both personal and environmental factors influence the use of HPDs. Based on this study, personal and environmental factors need to be targeted for further research using ecological models to develop interventions that promote HPD use amongst workers. From a study of recent hearing protector attenuation test data, this work presents a proposal to reconsider how data, gathered by recognized standard subjective test procedures, is used to calculate the single number performance rating of hearing protectors. Current practice is to embed the expected performance (mean) and the variation in performance (standard deviation) in a single rating figure. A proposal is made for clearly separating expected performance from the variation while retaining the use of the current subjective test procedures. This proposal is applicable to all current single number rating systems including SNR, NRR, SLC 80, and the newer ANSI NRS Ax.